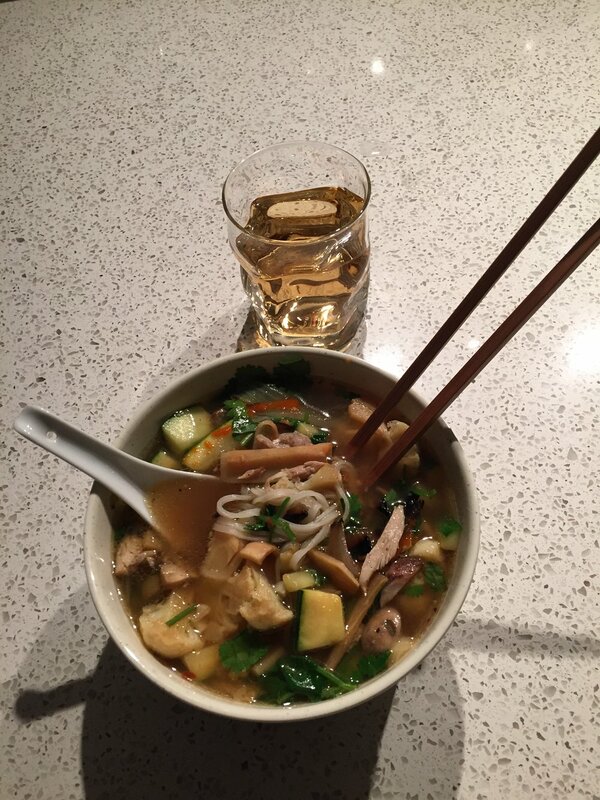 PHO-NOM-NOM-NOM-ENAL RECIPE — it's hung. Ok many people have been interested in the pho recipe I've been refining - so here it is - a step by step process on how I've been making it. It's actually shockingly easy - the only thing is that it takes time to cook the soup base because it needs to simmer for 2+ hours - but the great thing is if you make a giant batch of the soup base, you can freeze it and then it's easy to have pho whenever you want! 4-5 star anise - this is the KEY ingredient in pho soup. I usually buy it in a jar and it's great to always have on hand. Whatever protein you want - I've added chicken, beef slices, shrimp, it's all good! Whatever veggies you want - I love adding in: mushrooms, bamboo but some people just like sticking to the more traditional bean sprouts and basil route. 1) Throw your beef stew bones in a pot of cold water and bring it to a boil. Leave it boiling for about 5 minutes or so because you'll start seeing the residue of the bones or "scum" rise to the top with bubbles. You want all that gross bone residue to be released and rise to the top. 2) While you're waiting for the water to boil - start slicing up your onions (big slices) and ginger (small thin slices). Put it on foil on a baking tray - and broil this for about 5-7 minutes on high, or however long it takes for your onions and ginger to get silghtly charred. 4) By now, my onions and ginger have charred nice and brown. In the soup pot, throw in oil and some minced ginger and let that heat up on medium. Then throw in the charred onions and ginger. At this point - your kitchen will be overwhelmed with the smell of sweet delicious toasted onions and ginger - which is the hallmark of the smell of pho! Good job - pat yourself on the back now and do I what I like to do - eat some chips. 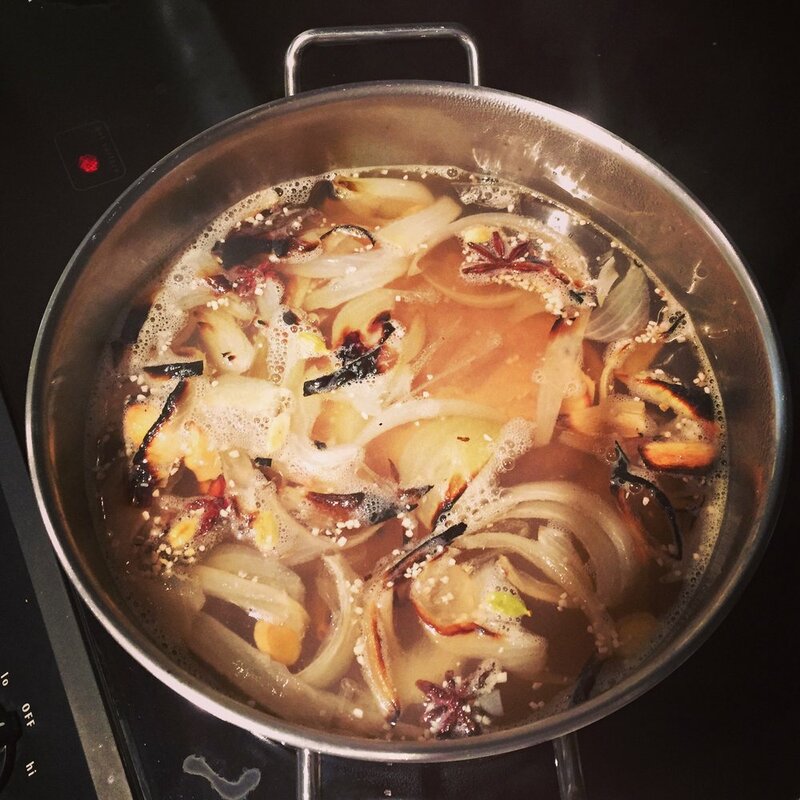 5) Ok back to soup pot - stir around the fried onions and ginger slices and then throw your beef bones back into the pot and add water - enough that you'll be satisfied with the volume of the soup you want. This is the start of your soup base! 7) That's it. Now you just turn it on a low heat and let it simmer for 2+ hours. Midway through, add some fish sauce and salt to taste. I would say quantity of this differs depending on a person's preference, I probably used about 1/8th cup of fish sauce and 3-4 tablespoons of salt, but I kept tasting and adding in more salt if I felt it needed it. 8) SIMMER SIMMER SIMMER! 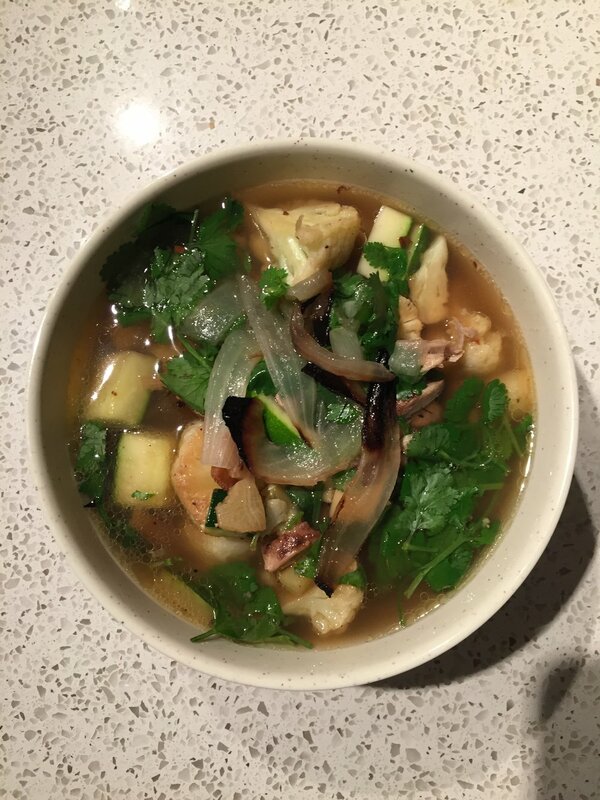 Go watch Mindy Project on Netflix like I did while I waited for the soup to simmer. 9) Ok so once 2 hours has passed, I would go get your pack of rice noodles and start soaking them in warm water. This is a critical step which you'll thank me for later. 10) Next - I would prep the protein you want to cook. This time around I had left over jerk chicken from a Superbowl party Dan attended, so easy peasy - I just ripped off shreds of that and set aside to top the pho later. 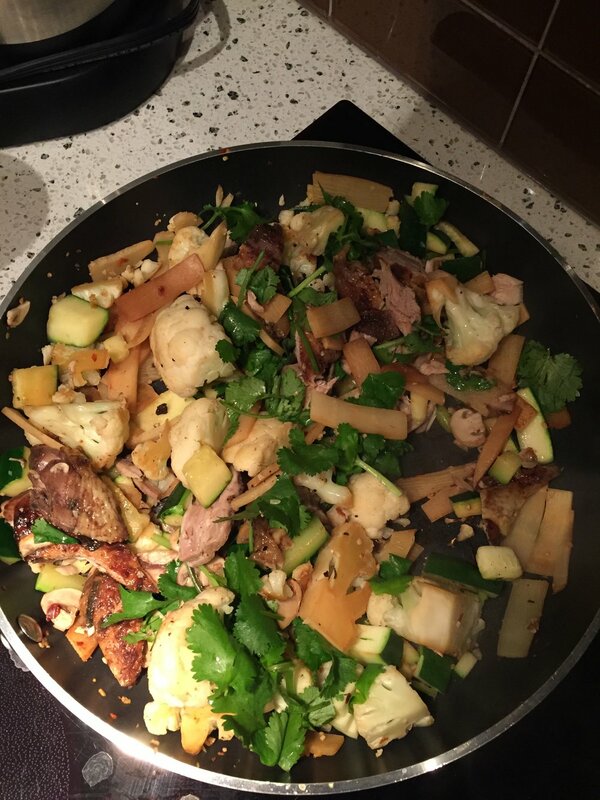 11) Next I stir fried the veggies - I used what I had in my fridge: cauliflower, mushrooms and I threw in a can of bamboo. I salt and peppered the veggies and threw in some garlic and soy sauce for flavour. Then threw in the pieces of shredded jerk chicken. 12) Ok by now you will make the call whether you're happy with the taste of the soup. For me, simmering for about 2.5hours was enough time for it to taste WONDERFUL. 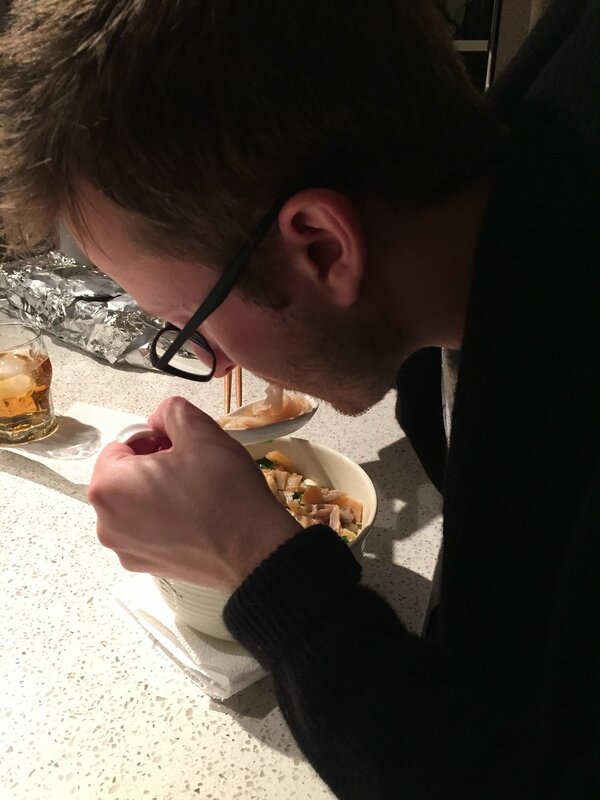 13) At this point, I took a handfull of rice noodles and dumped it into the soup pot for about 30 seconds Because you soaked them in warm water for at least half an hour, that means it doesn't take that long to cook AND you don't have to boil it in a separate pot. You just throw a handful in the soup pot and then scoop it out with tongs to throw in a bowl. 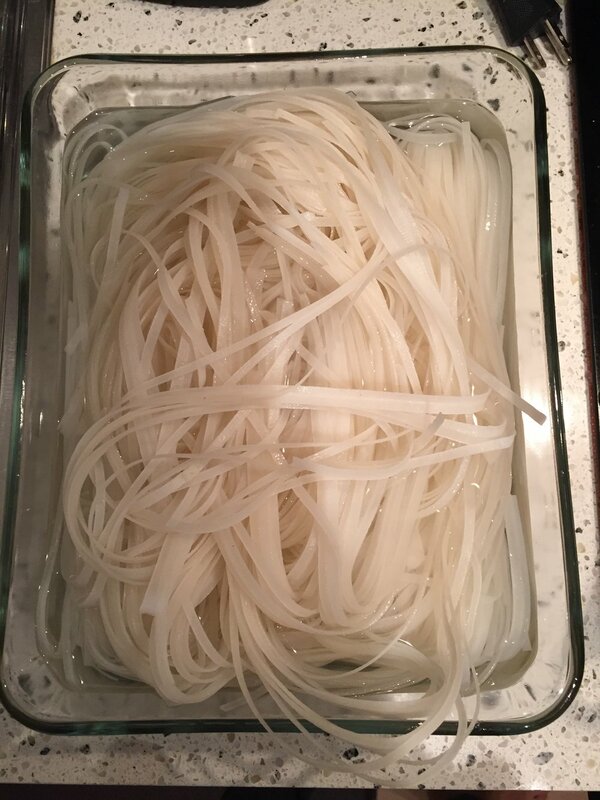 14) Once the rice noodles are in the bowl, just scoop out how much soup you want, and then top with your veggies and protein, and razzle dazzle with some cilantro if you like. Frankly my dear, you made 2014 the best!